Islamic State fighters have taken “tens of thousands” of people hostage and are herding them towards the city of Mosul for use as human shields as the battle for the militant group’s last major Iraqi stronghold intensifies, the United Nations has said. Isis also shot dead at least 232 civilians on Wednesday, the UN said on Friday, in its latest warning of atrocities by the group that has embraced rule by terror since it swept to power across the region. More evidence of crimes is likely to be unearthed as the self-proclaimed caliphate recedes into the desert. Some of the latest victims are understood to have refused to comply with orders to leave their homes, and others were former members of the Iraqi security forces, who Isis may have feared would rise up against the group as its enemies advanced. Speaking at a news conference, UN spokeswoman Ravina Shamdasani said the hostage-taking was aimed at making certain parts of Mosul “immune from military action”. “Isil’s depraved, cowardly strategy is to try to use the presence of civilian hostages to render certain points, areas or military forces immune from military action, essentially using tens of thousands of men, women and children as human shields,” Shamdasani said, using a different term for the group. As the offensive to reclaim the city paused on Friday to allow Iaqi forces to deal with attacks to their rear, there are growing concerns about the fate of civilians who have been living under Isis. They face a grim choice between retreating into Mosul to serve as human shields, waiting out fierce fighting in their homes, or fleeing to areas where they fear being targeted as collaborators or supporters of Isis. The battle pits up to 6,000 Isis fighters dug in around Mosul against 30,000 troops from a broad coalition including the Kurdish peshmerga, the Iraqi army and special forces, Shia militias allied with Iran, US warplanes and military advisers, and Turkish forces positioned to the north of the city. On Friday, Shia militias said they would soon attack to the west of Mosul, currently the only open route out of a city now surrounded on three sides, and reportedly used by Isis to transport some commanders and their families to Syria. People trapped along the path of Isis’s retreat say the group is branding anyone who refuses to head to Mosul with them an “apostate”, a crime carrying the death penalty under Isis rule, making fleeing to relative safety of government-controlled areas a risky gamble. “Daesh detains families or sometimes just young people as they withdraw from an area. My brother was in the village of al-Hood and is one of those that they have taken. We do not know what has become of him,” said Jassim, 36, a farmer from Qayyarah, using the Arabic acronym for the group. 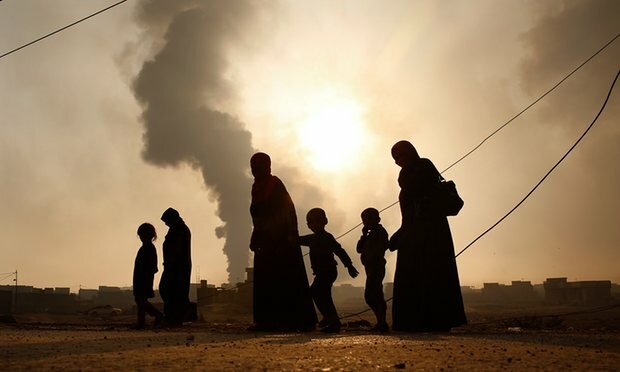 So far the UN has details of about 8,000 families who have been shifted from villages on the eastern and southern edge of Isis control towards the suburbs of Mosul and the city itself. One place Isis is thought to have taken hostages is the town of Hamam al-Ali, a stronghold for the group which had about 23,000 residents before the Mosul offensive. Now around 60,000 people are thought to be gathered there, the UN said. The US has been bombing vehicles used to move civilians towards Mosul, in an attempt to disrupt the forced march into the city, a senior US general told Associated Press. The buses and trucks have been struck when empty, and far from civilians, he said. Inside the city, residents said displaced people were arriving in their hundreds and moving into empty public buildings and offices, living in appalling conditions as chillier autumn weather sets in. “Congestion is increasing in the city, since the military operation began, hundreds of families from villages around Mosul began to come to the city and they are housed in schools and empty government buildings,” said Issa, a teacher in his 30s, who lives in the west of the city. He did not know if they had chosen to leave their villages or had been forced out by Isis, but said their situation in Mosul was dire, with most struggling to feed themselves or stay warm. “They live under difficult conditions and we are helping them as much as we can by giving them food, water, blankets and other needs. They are scared.” Former members of the security forces among the new arrivals have been taken away by Isis, he added, and their current location is unknown. There have also been reports of revenge attacks on men and boys believed to have fought for Isis or supported it, by the forces closing in towards Mosul. Shamdasani said it was vital that Isis killings did not draw security forces into a spiral of violence. “In the face of these flagrant violations of international humanitarian law by Isil, it is even more crucial that government forces and their allies ensure scrupulous respect for these laws,” she said. In some areas residents thought to have supported Isis are being blocked from returning home, with fighters citing security concerns and boasting of summary executions. “Captured (Isis) fighters and those perceived to have supported them must be held in accordance with international law,” Shamdasani said. Adding to concerns about those trapped near the frontlines, Amnesty International warned it had credible reports that white phosphorus had been used around Mosul. The chemical, which burns at an extremely high temperature on exposure to air and can sear through flesh and bone, is allowed in some battlefield situations but is illegal in areas with a civilian population. In addition to the concerns about Isis’ human shields, the Iraqi military has “paused” its advance to Mosul, as it confronts Isis attacks . Dorrian did not discuss the seriousness of the resistance the Iraqi lines are confronting, though he conceded some had encountered “tougher areas.” From the start of the offensive earlier this month, US and Iraqi officials have portrayed the defeat of ~Isis in Mosul as inevitable. Dorian said the advance is expected to resume after “a couple days” as forces reposition and resupply.